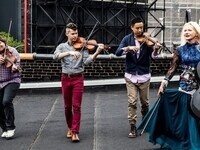 Established in New York City in 1998, ETHEL quickly earned a reputation as one of America’s most adventurous string quartets and part of a generation of young artists blending uptown, conservatory musicianship with downtown genre-crossing. The quartet features Ralph Farris (viola), Kip Jones (violin), Dorothy Lawson (cello), and Corin Lee (violin), and plays with the intensity and accoutrements of a rock band. Continuing a deeply successful six-year collaboration inspired by ceremonies dedicated to the Sun, ETHEL and Robert Mirabal (Native American musician, instrument builder and three time Grammy® Award-winner), present their next evolution of the cross-cultural concert experience: The River. The inspiration is Water as the embodiment of Spirit, and its essential role in Life on Earth. The audience is immersed in a flow of music, narrative, and ritual that evokes timeless Native American traditions through contemporary musical artistry. As delivered by these master performers, the effect is breathtaking, even ecstatic. The program is an integral journey in instrumental virtuosity, song, and storytelling, created uniquely for this event. From An Kha Na to Peace Calls, through rushing rapids and sacred spaces, ETHEL and Robert Mirabal evoke the magic and majesty of The River which connects us all. Audiences will find their hearts healed and their hopes raised. This performance is funded in part by the James and Vera Olson Fund for the Arts.